Since MC's birthday will fall on Labor day weekend this year, we decided to have her party a week early! 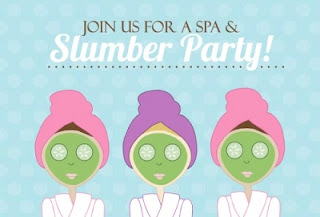 And she has been begging for a sleep over and spa party....so we combined them for a Spa Slumber party! EIGHT whole fingers! So glad I have a full week to digest this before it becomes real! She picked out every detail even down to the cake and it turned out SUPER cute! My big sweet girl! I remember when your birthday cake had a #1 candle on it! The years are just flying bye way to fast! When daddy saw the cake we immedialty said....WHY does that cake say 18?!?! It cracked me up! After I quit laughing so hard I explianed that was a bottle nail polish NOT the number 1! LOVE the spa face on the cake! And you did an awesome job picking out the cookies too! They may have looked cute but they tasted WONDERFUL! OMG the whole crew..........11 girls! Singing Happy Birthday to my big 8 year old! Thinking LONG and HARD about the wish she wanted to make! Blowing out all EIGHT candles! Friends, Pizza, Cake, Cookies, Ice Cream......what more could ya ask for! Yummy fruity drinks for yalls pedi and manis! Soaking their toes in their warm water! Ms. Taylor brought her chair and did all theirs hair! Kinley was in HEAVEN! 11pm and these girls were going strong! Us adults on the other hand...........were struggling to stay awake! Midnight and even little Ms. Greer was still going at it! They played house, truth or dare. There were more squeals than a Justin Bieber concert! Sweet Halle trying to play shy! Finally at 12:45 they started winding down! And of course they were right back up bright and early at 7am! They danced and of course squealed some more,lol! Brother loved all the action! He was dancing and clapping right along with them! WELCOME 2015-2016 School year! Our summer flew by and your totally snuck up on us! As much as I LOVE summer time, it is sure nice to get back into a regular routine! 6:40am rolled around WAY toooooo early for my girls! They didn't know what hit them! I got........NO MOM! Please can we have 5 more minutes............lets just skip today (my favorite)! But eventually they figured out they were going like or not and they needed to get moving! MC.......my big 2nd grader! I can remember your first day of Kindergarten like it was just yesterday! Kindergarten was a very rough experience for you and about killed my soul! But first grade was awesome and really helped you come out of your shell. And now you are SUPER DUPER ready for 2nd grade! You absolutely L_O_V_E school and that makes me so happy and proud! I think you have grown over a foot since last year! YIKES! I could NOT believe it when you wanted to wear a bow in your hair.......shocked me!!!! Love you MC........enjoy 2nd grade and all it brings! Oh my little sas-a-frass! You so badly want to be in Kindergarten this year but you've got one more year till that happens. But, I promise you it will be here before you know it!!!! You picked the pants out and you rocked them sweet girl! You just look so grown up! We all loaded up and head to 2nd grade drop off! Had to get a quick selfie of me and my big girl before we walked in! Your 2nd grade class room! And KB had her LAST first day at daycare! She was excited to show us her new cubby and pencil box! KB and Madi! I can't believe this is the last year these two girls will be together! Madi will be going to kindergarten in another town and that just breaks out hearts! They have literally been together since they were infants! Praying you all have a wonderful and safe 2015-2016 school year no matter where you are!